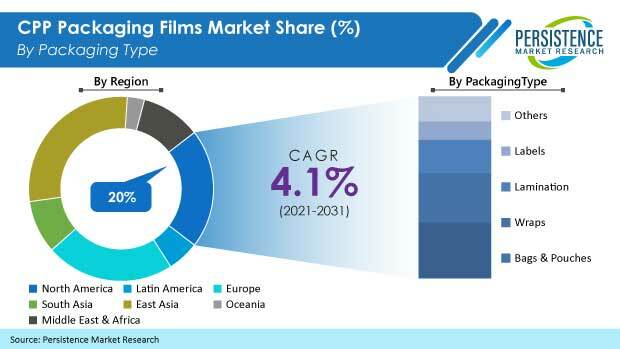 With the growing preference towards convenience foods, different types of packaging films have been growing popular in the global market, based on their special properties. CPP is one such type of packaging film that finds high adoptability in the global market with its multifunctional properties. Among the different packaging types such as bags and pouches, wraps, lamination, and labels, bags and pouches is projected to be a highly lucrative packaging type with a steady rise in demand attributed to an increase in consumption of convenient food. The bags and pouches market is anticipated to reach a market value of over US$ 2,200 Mn by the end of 2028, witnessing a steady growth rate of 4.5% during the forecast period. The wraps market is also in strong competition with bags and pouches and is expected to grow at a CAGR of 4.3% during the forecast period. Manufacturers always look for different properties in a single packaging material to safeguard their products and diminish the chances of any loss. CPP packaging films have been a preferred choice for manufacturers owing to inherent properties such as low density and highest yield of polymer. This makes CPP films a cost-effective packaging option. Further, CPP films are also facilitate increase in shelf life of products with their high moisture barrier property. These attributes have spurred demand for CPP films in the global market. Cast polypropylene films also have excellent machinability, which makes these an ideal choice for freezer bags and microwaveable packaging solutions. These films provide a superior heat seal layer for retort or steam sterilization applications and other flexible packaging multi-layer applications. Cast polypropylene films are available in different types, such as twist wrap lamination, metalisable, and other cost-effective packaging applications. The push to the global CPP packaging films market is also a result of its sustainable format, which provides a bio degradable type of packaging. Sustainable packaging helps in controlling the level of bacteria inside the films after packaging by using naturally produced CO2. Looking at the lucrativeness of CPP packaging films in the global market, companies are leveraging different opportunities to expand the packaging material market to launch new alternatives of CPP films. Manufacturers are incorporating various materials such as PVDC, EVOH, and PA, which are being used as barrier materials. Along with various alternative packaging materials, high-barrier coatings are also being used nowadays. Some of the manufacturers use a combination of both high barrier coatings and high barrier films to provide better protection to the packaged products. An India based manufacturer, Cosmo films, has also launched new and transparent barrier films that can be wrapped over coffee and tea, perfume boxes, chewing gums and more. These alternative products may restrict growth of the global CPP packaging films market to a certain extent.